Have you ever seen a chrysanthemum seed? They look like little brownish shriveled up things. But, if you take that seed and you bury it in the dirt, what happens? You get this amazing flower —totally unlike the seed that was planted. Do you see what Paul is getting at here? If our body (usually little brownish shriveled up things) dies, how will God raise us and what will we look like when that happens? We are foolish to even ask the question, because the difference between what dies and what is resurrected is as different as the chrysanthemum seed is from its flower. I think it's fair to let our imaginations run with this for a little while, because I believe that our new bodies will be beyond anything that we can imagine. Holy Spirit, open my mind, please, to be able to imagine—even just a little bit—what life will be like with You once I shed this body of flesh. Amen. Nowhere in Scripture do we see people slowing down or retiring from God’s work—if you’re still alive, God has a purpose for you! 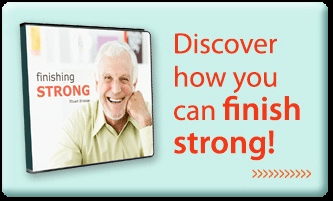 Stuart Briscoe’s 4-message CD series, Finishing Strong, will help you do just that—no matter your age, health, or circumstance. Request your copy of Finishing Strong and serve God until your dying day!